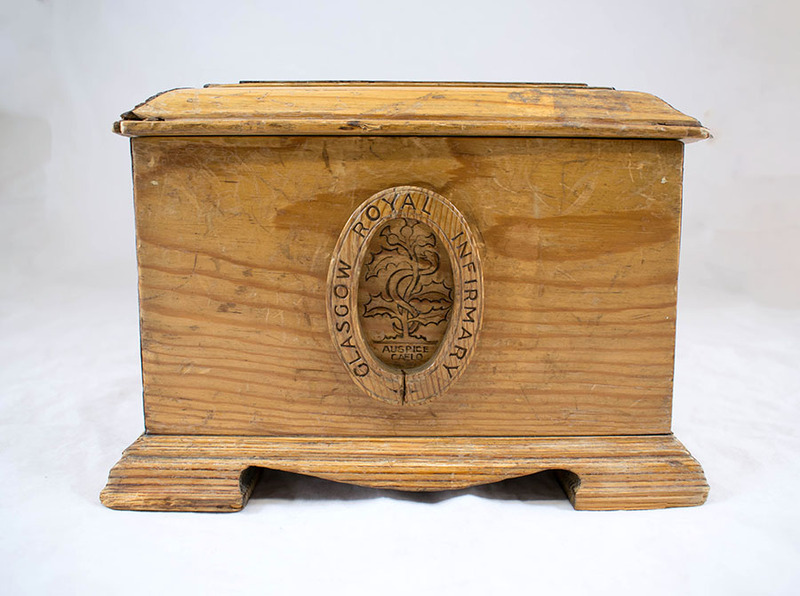 Gavel casket made using timber from the former Lister Ward of the Glasgow Royal Infirmary (demolished 1924). An illustration of the original GRI building (demolished 1912) carved on the front. The handles on the sides are carved with the emblem and motto of the GRI. Emblem and motto of Clan Jardine carved on the back. 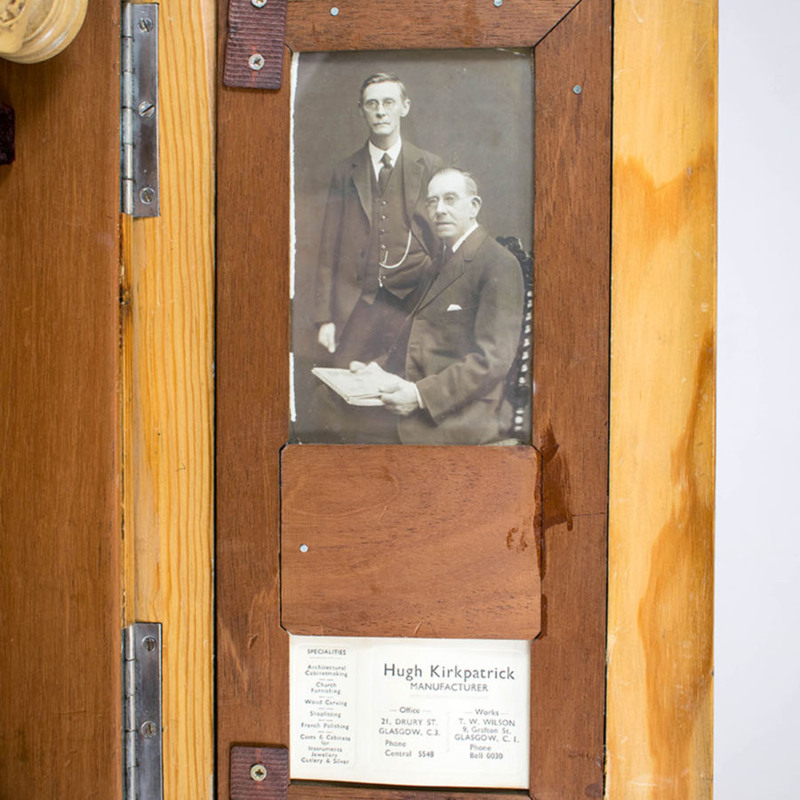 Photograph inside the lid of Andrew and William Brown. 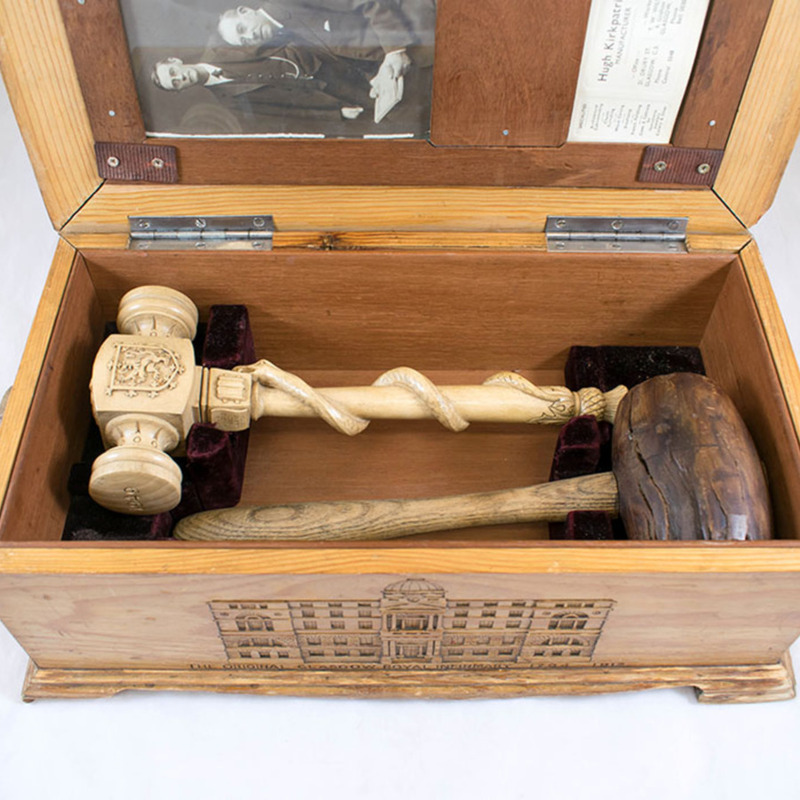 Box contains hammer from Macewen's theatre (object number 455) and Royal Faculty anniversary gavel (object number 456). Silver plate on top of box: "Presented to the Royal Faculty of Physicians and Surgeons of Glasgow on the 29th November, 1949, and to perpetuate the memory of Andrew and William Brown J.P., who as instrument makers to the Royal Infirmary served the great surgeons Lord Lister and Sir William Macewen, by Mr. Andrew Jardine, newphew of Messrs. Brown. 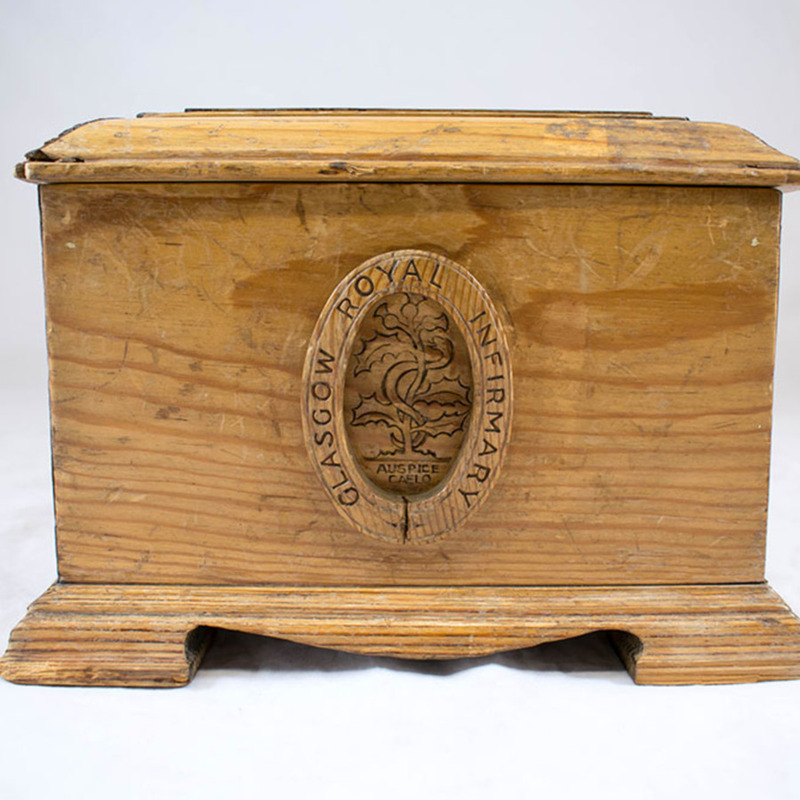 This casket is made of timber from the Lister Ward of the Glasgow Royal Infirmary, Built 1859 - Demolished 1924." 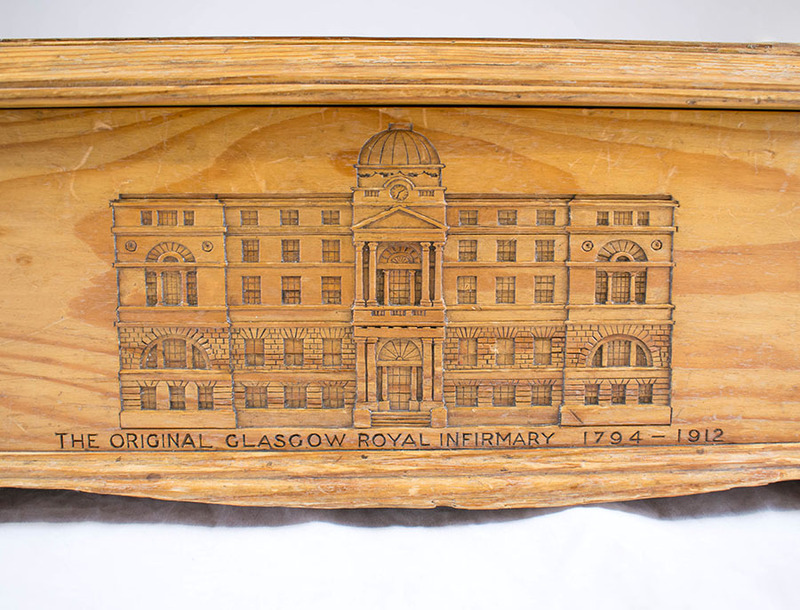 Carving on front of box: Image of the original GRI building; "The original Glasgow Royal Infirmary 1794-1912". Handles on sides of box: Thistle and serpent emblem of the GRI; "Auspice Caelo". 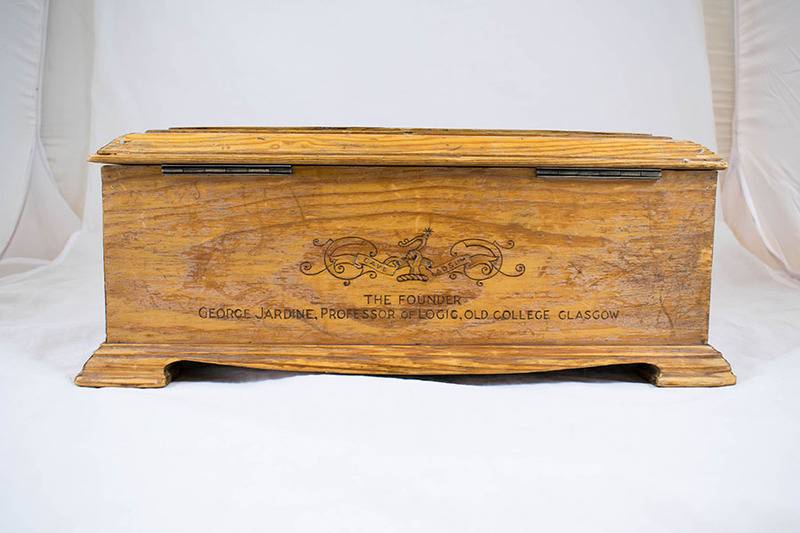 Carving on back of box: Emblem and motto of Clan Jardine, "Cave Adsum"; "The founder George Jardine, Professor of Logic, Old College Glasgow". Height = 16 cm; Width = 41.5 cm; Depth = 22 cm. 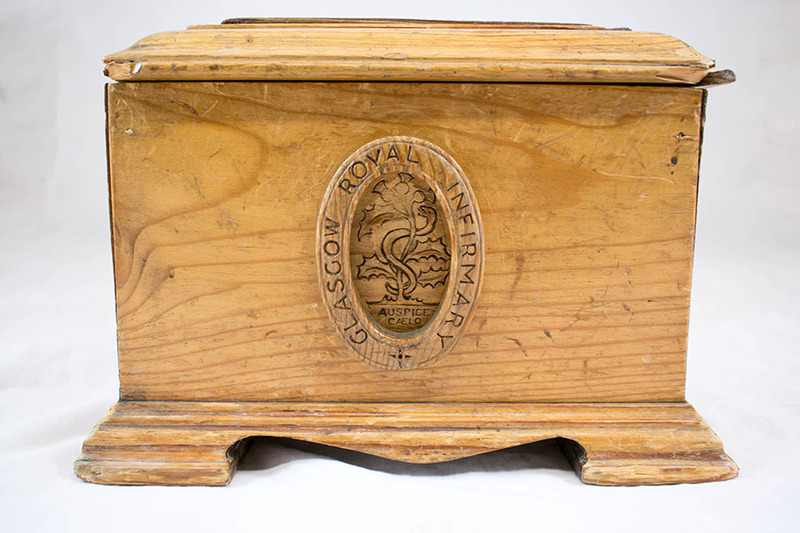 Lang; James (1878-1956); Mr and Hugh Kirkpatrick, Manufacturer, “Gavel casket,” Heritage, accessed April 25, 2019, https://heritage.rcpsg.ac.uk/items/show/607. 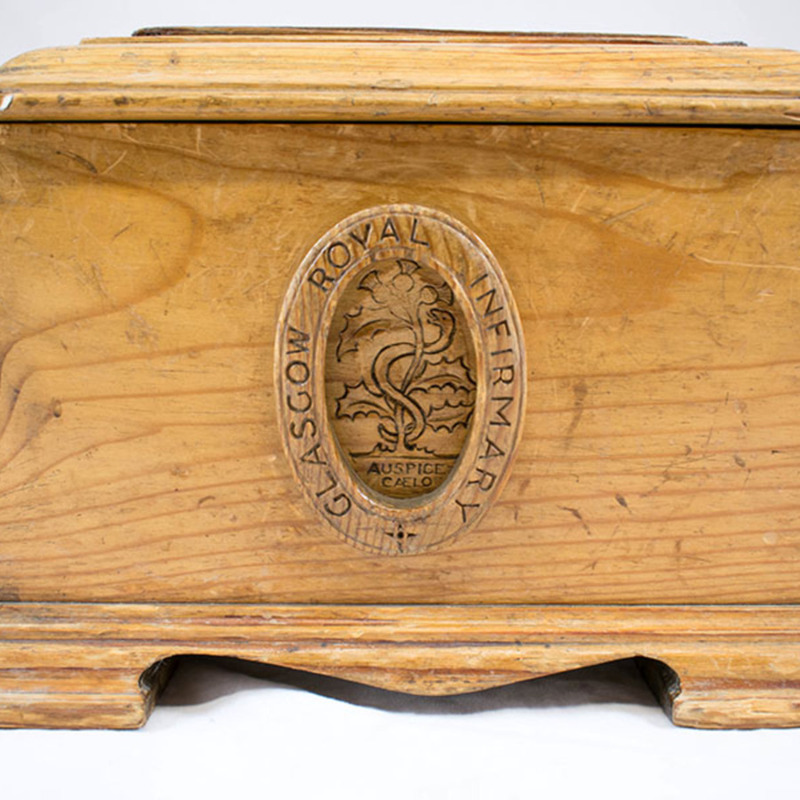 Description: Gavel casket made using timber from the former Lister Ward of the Glasgow Royal Infirmary (demolished 1924). An illustration of the original GRI building (demolished 1912) carved on the front. The handles on the sides are carved with the emblem and motto of the GRI. Emblem and motto of Clan Jardine carved on the back. 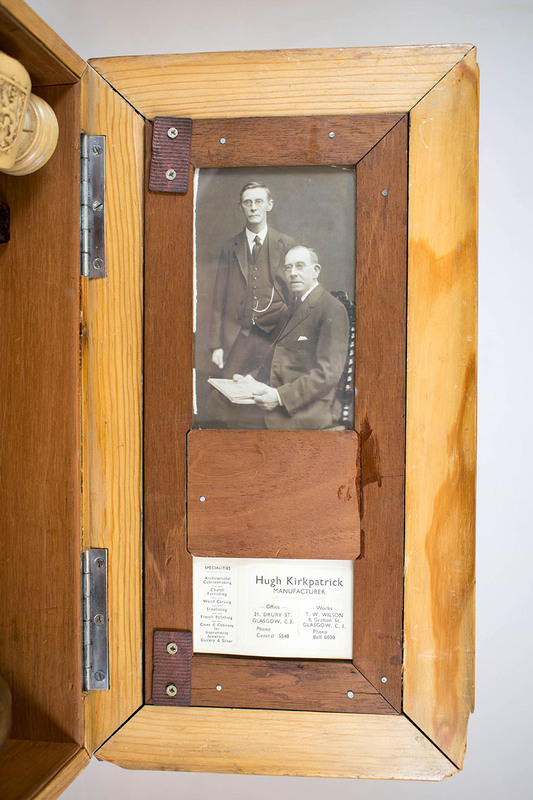 Photograph inside the lid of Andrew and William Brown. 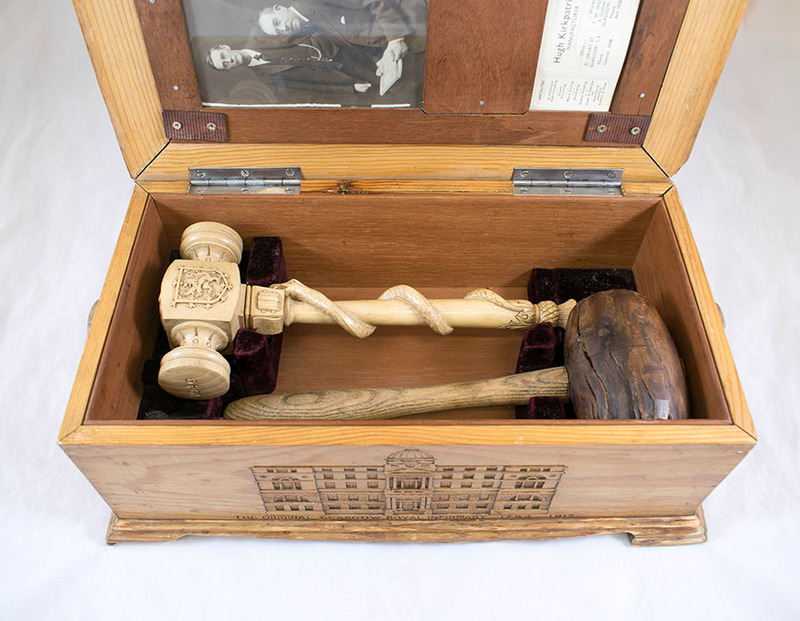 Box contains hammer from Macewen's theatre (object number 455) and Royal Faculty anniversary gavel (object number 456). 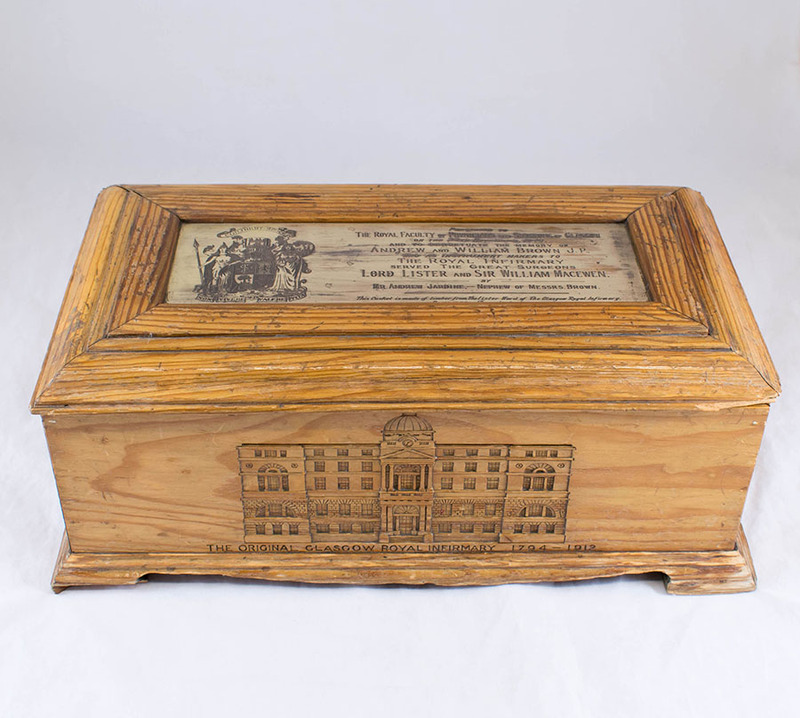 Silver plate on top of box: "Presented to the Royal Faculty of Physicians and Surgeons of Glasgow on the 29th November, 1949, and to perpetuate the memory of Andrew and William Brown J.P., who as instrument makers to the Royal Infirmary served the great surgeons Lord Lister and Sir William Macewen, by Mr. Andrew Jardine, newphew of Messrs. Brown. 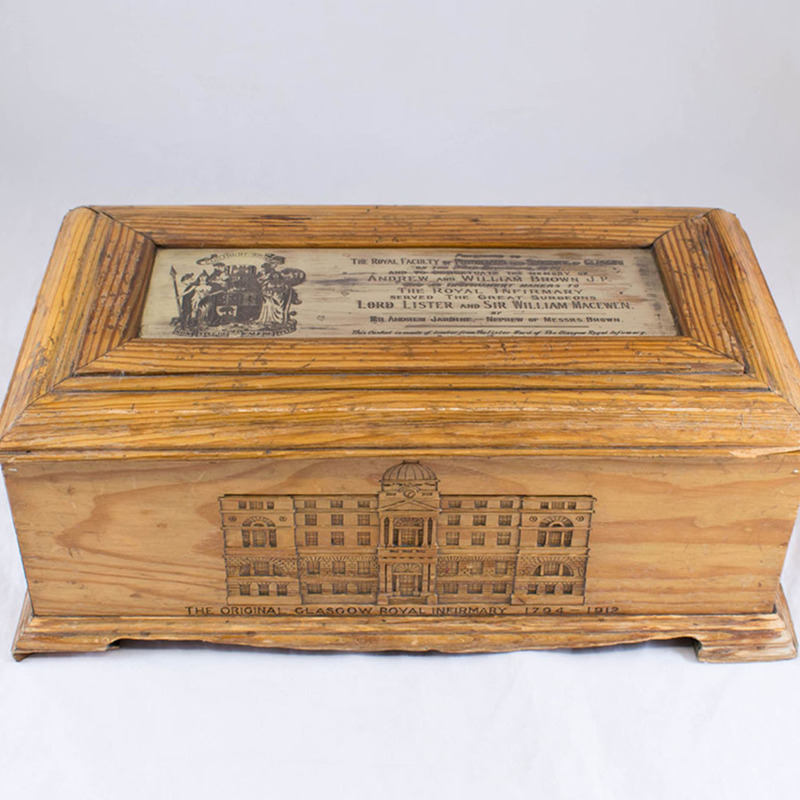 This casket is made of timber from the Lister Ward of the Glasgow Royal Infirmary, Built 1859 - Demolished 1924." 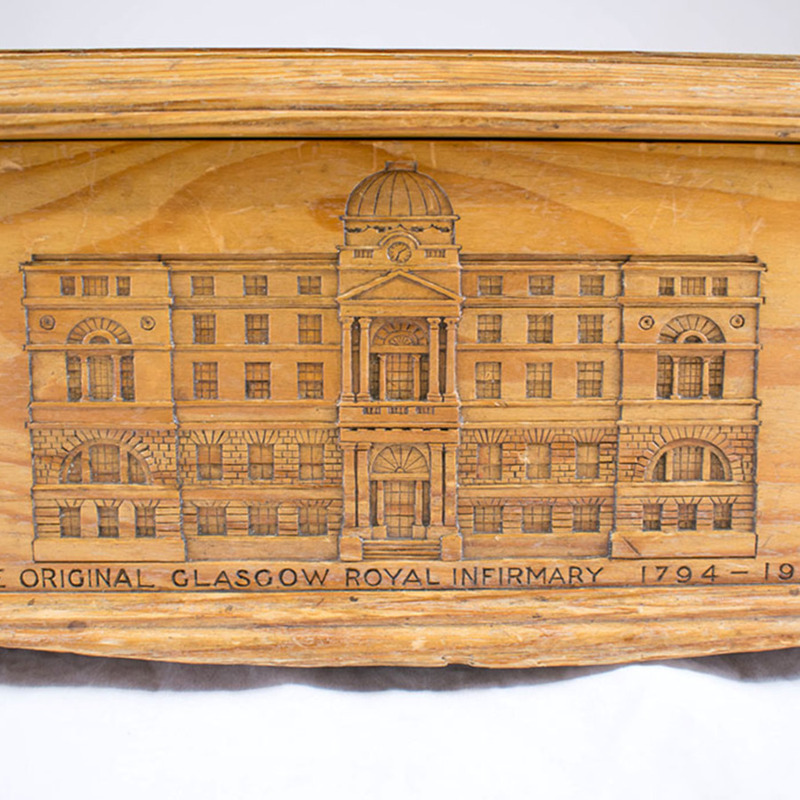 Carving on front of box: Image of the original GRI building; "The original Glasgow Royal Infirmary 1794-1912". Handles on sides of box: Thistle and serpent emblem of the GRI; "Auspice Caelo". 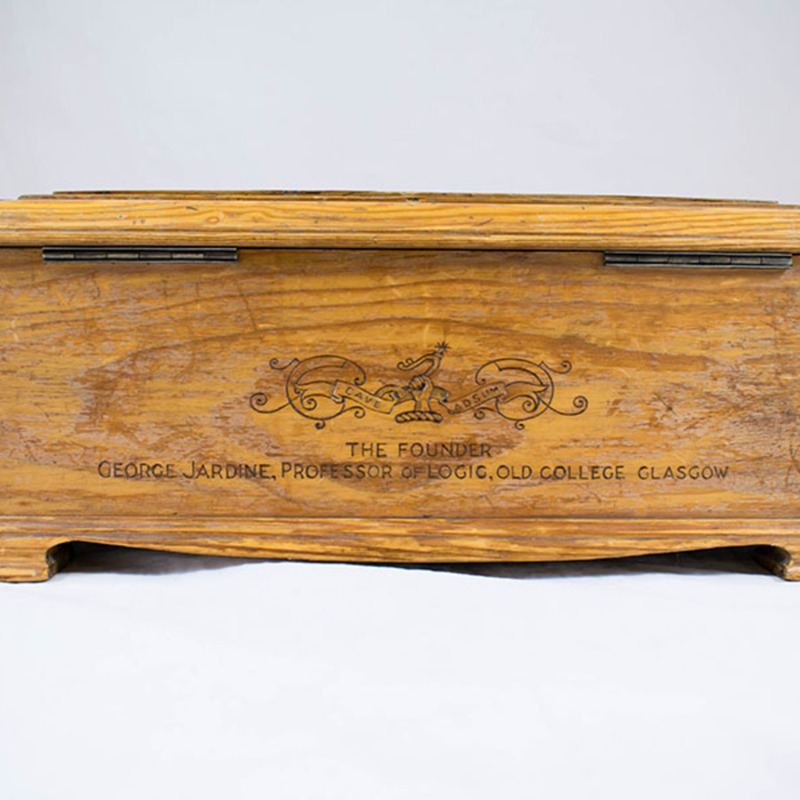 Carving on back of box: Emblem and motto of Clan Jardine, "Cave Adsum"; "The founder George Jardine, Professor of Logic, Old College Glasgow".